Women with prior gestational diabetes mellitus (GDM) are at higher risk of type 2 diabetes (T2D). The aim of this study was to investigate the association between fruit and vegetables (FV) intake and abnormal glucose tolerance (AGT) among women with prior GDM. A total of 281 women with prior GDM have been recruited a mean of 6 years after their pregnancy in this cohort study. FV intake was obtained with a validated food frequency questionnaire (FFQ). Anthropometric and glycemic components were measured during their clinical visit and women were stratified according to normal glucose tolerance (NGT) or AGT. A cross-sectional analysis showed that a total of 155 women had NGT and 126 AGT. 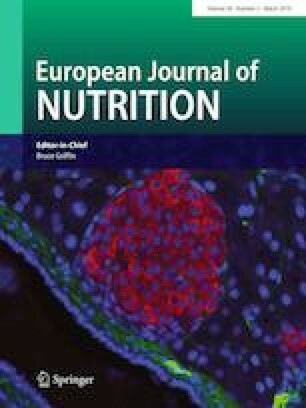 Women with AGT had significantly lower FV (6.5 ± 0.2) and vegetables servings (3.9 ± 0.2) and tended to have lower fruit servings (2.6 ± 0.2) than women with NGT (7.4 ± 0.2, 4.5 ± 0.2 and 3.0 ± 0.1, respectively) (p = 0.001, p = 0.04 and p = 0.10, respectively, adjusted for age and BMI). FV intake, per one serving increase, was associated with a reduced likelihood of having AGT [OR = 0.88 (0.81–0.97) after adjustment for age and BMI]. Vegetables or fruit intake tended to be associated with a reduced likelihood of having AGT [OR = 0.88 (0.78–1.00) and OR = 0.88 (0.76–1.02), respectively, after adjustment for age and BMI]. Higher intake of FV may be associated with a lower likelihood of AGT among women with prior GDM. Further studies are needed to confirm these results in this high-risk population. We would like to sincerely thank all participants for their participation. This work was supported by the Canadian Institutes for Health Research (CIHR) and by the Fonds de la recherche du Québec en santé (FRQ-S). Ethical approvals were obtained from Laval University and CHU de Québec research ethics committees.